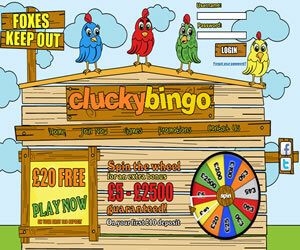 Clucky Bingo opened the gates to their virtual farmyard in June 2013 as part of the 15 Network. Landing on the home page for the first time may be a shock to the system as it looks more like a child's educational site then an online bingo site due to the simplistic cartoon graphics and the multi-coloured chickens sitting on top of coop. The 'Foxes Keep Out' sign did raise a smile though and we were left wondering if they were talking about the purple suited Fox from the most famous bingo brand on the market. The home page itself is very basic and does not contain a great deal of information apart from details of current welcome offers and bonuses and a small list of recent winners. You definitely won't want to spend too long on this page as the spinning wheel is extremely irritating and actually made our eyes go funny after just a few minutes. Click on the 'Join Now' link and you will be taken to the registration page which is straightforward enough but you may need to use an alternative username and email address if you already have accounts on any of the other 15 Network sites. Once you have registered and headed into the lobby you will find that Clucky Bingo is powered by the Jumpman Gaming software. This is not one of the really well known platforms but it is used by other sites you may have heard of including Lights! Camera! Bingo, Showreel Bingo and Spice Bingo. 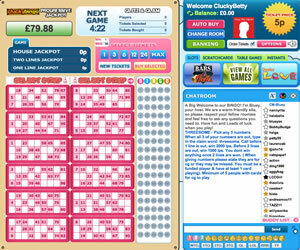 You will find just four tabs offering 90 ball bingo, 75 ball bingo, jackpots and a small selection of instant games. There are only a few rooms to choose from but this is not necessarily a bad thing as it funnels all of the players into one place which in turn results in larger jackpots. The rooms themselves are basic but functional with the whole left hand side of the screen dedicated to displaying your cards and the balls as they are called. To the right of the screen you will find the chat room where you can enjoy a bit of banter with your buddies and they have built in a range of emoticons and acronyms for the most commonly used phrases such as 3TG, 2TG, 1TG and WTG which really come in handy and save you some time especially when chat is busy. Just above the chat room you can access a number of mini games and you can play these without them interfering with your bingo fun. 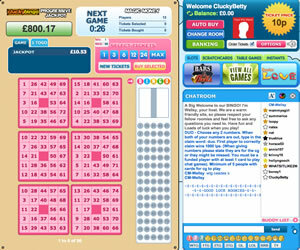 Promotions at Clucky Bingo are few and far between as all they have on offer are the networks standard offerings which include specials such as Team Bingo, Lucky Lotto, Friday Fever and Weekend Wad, but none of them are really going to set your world on fire. There are of course the jackpot games but at the moment these are a bit on the low side; We must remember though this is a very young online bingo site and as more players register there will be more people contributing towards the prize pot so in time these will increase. Clucky Bingo really need to up their game if the want to compete with the more established brands out there. They are not doing anything particularly badly but by the same respect they are not offering anything unique to make them stand out from the crowd. The fact that you can only fund your account with credit and debit cards is really going to hold them back as a lot of players prefer to use secure online methods such as UKash. They say you need to crack a few eggs to make an omelette but we can't help but feel the chef behind Clucky Bingo forgot to read the recipe for a successful bingo site. 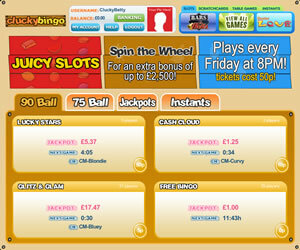 Clucky Bingo currently offers 75 and 90 ball bingo games alongside a selection of instant win games. For reload bonuses a minimum of £10 is required. The are no specific wagering requirements at Clucky Bingo you simply have to have wagered at least £30 in real cash in your lifetime as a player with the brand, provided ID and have £30 in real cash in order to withdraw any money from your account. You should note that when you do process a withdrawal that all bonus funds and loyalty points are removed from your account.